This brand new Breaksafe comes with all the features that you have come to expect in the previous Breaksafe models. 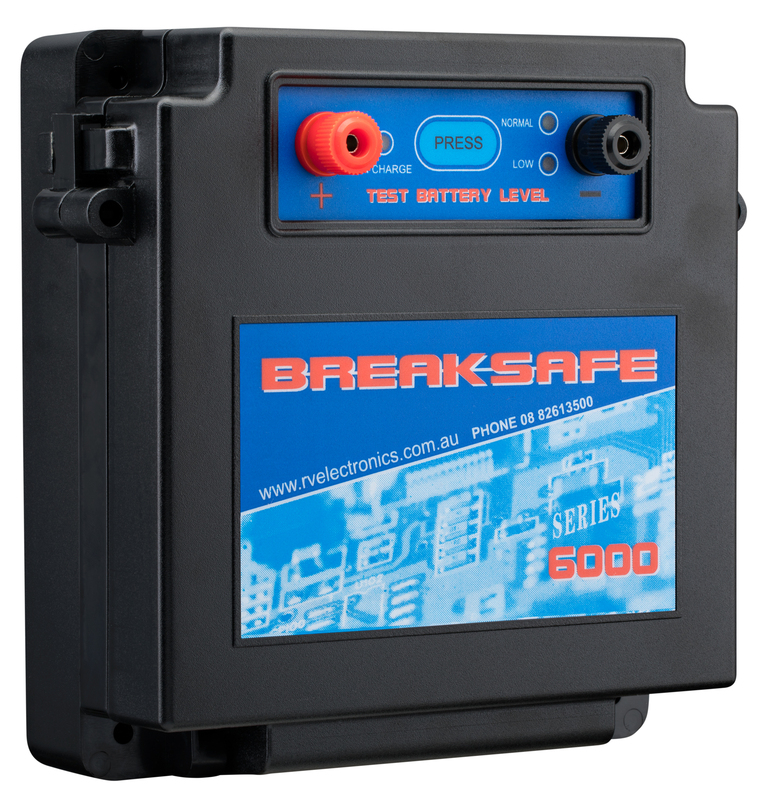 The Breaksafe 6000 has the addition of many innovative new features including easy access to the battery compartment for servicing and fully enclosed internal circuit board case for better water resistance. The Breaksafe Breakaway System has been designed to activate the electric brake system and brake lights on all caravans, travel trailers, trailers, horsefloats and campers in the event of an accidental separation (e.g. Breakaway). Breaksafe will not only apply the electric brakes and the brake lights of the trailer, but will keep them applied for around 20 minutes, enabling you to secure your trailer when it has come to a stop. Breaksafe has its own power supply, which charges via an auxiliary line while driving, or it can be charged externally with a battery charger. It also has a battery condition indicator, allowing you to tell the condition of the battery, with the push of a button. Each Breaksafe kit comes complete with battery, coil cable breakaway switch and all mounting hardware, as well as full installation instructions. A RM6000 Remote Battery monitor is required for registration in NSW. 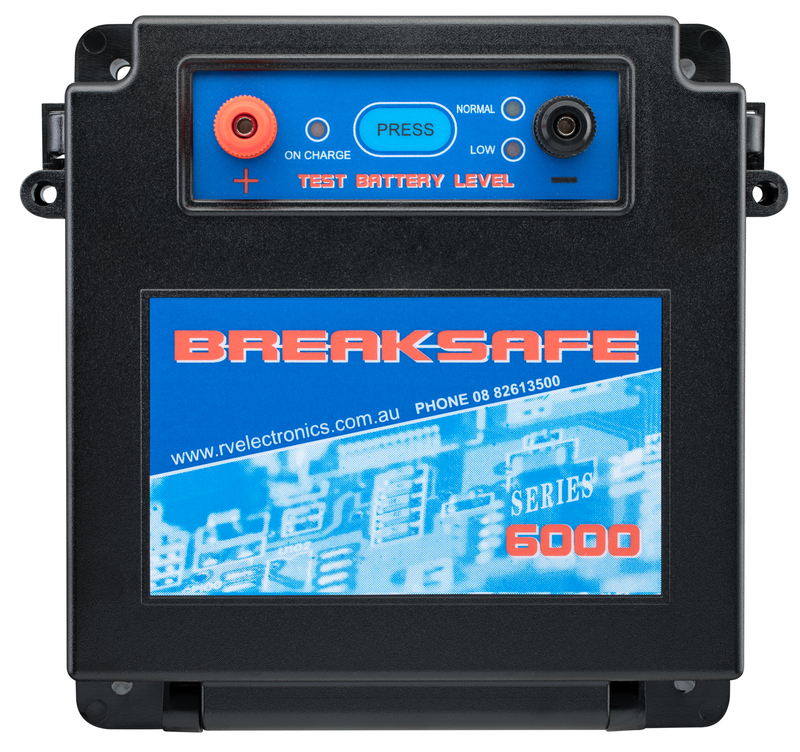 To comply with NSW regulations, only connect a Breaksafe 5000 or 6000 with a Breaksafe or Redarc Remote Battery Monitor. Connecting any other brand voltage monitor will void all warranty on your Breaksafe and breakaway battery. This includes wireless and wired monitors.